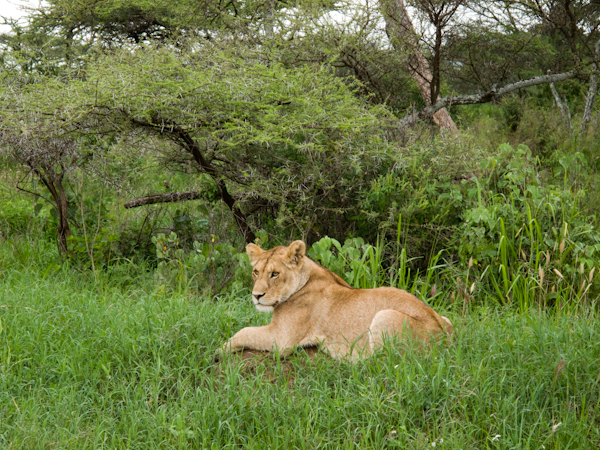 Five minutes into the park we saw a young lioness tearing apart a Buffalo. If you have never seen a grown lioness stretch and flex her massive figure, let me just note they are sculpted power. It left an impression. Safari guides have a network of communication to inform each other of the animals presence, which is done entirely in swahili so as to surprise their clients. I learned all the swahili names for the animals in advance and it became a source of amusement between our guide and myself, because I knew that chui kwa mtoto was a leopard with baby and were were on our way to find one. I didn’t ruin the surprise for Darlene or our two swedish friends, Anna and Lina and the guide and I shared some laughs. On the other hand, I also knew that the words simba, tembea, hapa, and sasa, when all used together in a single sentence meant lions were heading our way, toward camp, right now. It was getting dark. Our guide prepared to sleep in his land cruiser and the camp staff in a caged banda, but it was the clients that stayed in the little exposed vinyl tents. I should mention this safari was another “good deal” because we had a friend with a friend in the business. Before crawling into our tents, a herd of six buffalo came grazing behind the banda. Everyone huddled inside until they were gone. The affable mzee, Daudi, explained that yes, as I had heard, there were three lions tracking these buffalo. He imitated a lions call so we would know it. No more then ten minutes later we heard this sound again, but this time he was pointing, hapo, there. If you hear the baboons, he said, imitating their calls, it means they are alarmed by lion. Then he demonstrated the hyenas cry, explaining that hyena follow lion. We started taking in all the sounds, registering them, and realizing that no sound was the best sound. Miraculously, we actually fall asleep. Darlene woke at one thirty, do you hear that? No, I was asleep, mercifully. It’s getting closer, she said, and she also moved closer gripping my arm tighter. My attempts to fall back to sleep were denied. Clearly, she wanted to share this experience. All noises lead to lions, I reminded her, but she was way ahead of me on that one. Within ten minutes the baboons were howling and we could hear Anna and Lina’s anxiety in the neighboring tent. We never asked what to do if a lion starts sniffing at our door. The staff only advised no food in the tents, but hamna shida, the animals are accustomed to them and wont bother us. 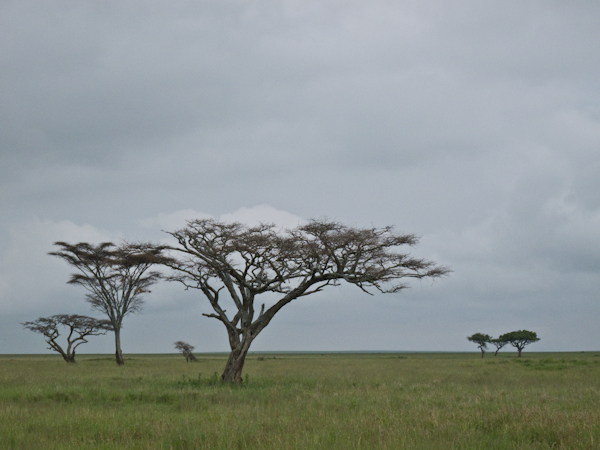 That night, under the Serengeti sky in a little vinyl tent at the end of the road, we heard with absolute distinction, the rise and fall of hooves, the snorting of breath, and the cracking joints of six grazing african buffalo. We could hear grass from the patches between our tents, being gripped, torn, and eaten as we remained frozen solid in the dead center of our tent. Darlene categorically identified every sound, hyena, baboon, anxious swedes and the complete lack of aide coming from the staff. We remained wide awake until morning. I was the first to venture out at the crack of dawn, luring our driver from his car, anxious to get the day started. Duadi pointed out the tracks of a lioness and a hyena that had passed thru our camp. Tracks also clearly showed that we had been smack dab in the middle of where the buffalo roam. Before breakfast we set out in the land cruiser to take in the life of the early dawn. 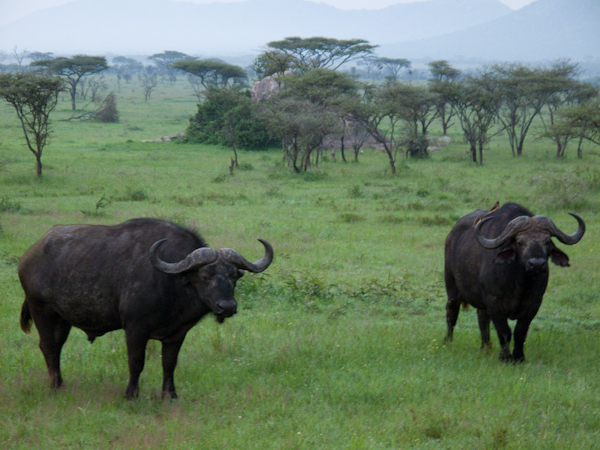 No more than a few hundred yards from our camp, we saw the six buffalo and three stalking lioness. We astutely noted that these three powerful ladies had no kill and must be a bit hungrier than yesterday. If we could have bought them a buffalo to curb their appetite, we would have and before we camped again that night, I dug out our headphones, though in retrospect those nights were full of sounds we will cherish forever. you two may want to think about working for national geographic as your pictures and words are clear,stunning and bold. excellent work from you both. two hundred and fifty million people wish they could tag along , i being one ., say, have you two come across a older man who goes by the name ” the emperor” if not he will be in viet nam sometime in june, be sure and look him up as he would be happy to see you. keep up the nice stories and photo’s. I’m thrilled for you. Incredible experiences. We were told to keep our tent doors closed…zipped as our line of defense. Aren’t the wildebeest ugly? Were they calving?